Have you ever fallen through the ice? I have, and honestly, it was scary! Years ago, when I was around 15 years old, I was hunting with my younger cousins down by the river bottoms as we call it. It was super cold and the snow was white and fluffy from the night before. There were several side channels that had become frozen, but the main river was still open. We decided that we would have better luck hunting on the main river channel that was still open. However, to get there, we would need to cross over the frozen side channel. Somehow it was decided that I would be the one to walk across first. As I stepped out on the ice, I could feel the ice crunching beneath my feet with every step. That should have been my first clue that the ice was not safe to walk on. The river was about 15 feet across and I was about half way to the other side. I heard a loud cracking sound and could see some rather large cracks splitting through the ice around me. Next thing I know, water was slowly collecting around my feet. I knew that I was going to go through the ice and there was nothing I could do about it, but prepare myself. I took my next step and through the ice I went! As I began to fall, I reached my arms outward while leaning my upper body towards the ice that had not broken. Luckily, the ice ahead of me didn’t break and I was able to use my arms to pull myself out of the water and crawl across the ice to safety. I know that I was lucky that day, and I have never put myself in a situation like that again. However, sometimes despite your best preparation, accidents happen. Should you ever find yourself in the same situation as I was in, remember to follow these simple tips to help you get out of the water and towards safety. Once you have that gut wrenching feeling that you are going the fall through the ice, the most important thing you can do is to not panic. Think of where you are, what you will do to get out and where you need to go once you are out. If others are with you, let them know that you’re about to go through the ice so that they will know that the ice is not safe to walk on and that they will need to go get help if you do go through the ice. As you begin to fall through the ice, spread your arms out to try and catch yourself on the unbroken ice. This will enable you to keep your head out of the water and to support yourself as you work to get out of the ice. Note: This is extremely important if you are walking on a frozen river where you could be swept under the ice and away from the hole and trapped under a sheet of unbroken ice. The initial shock of the cold water can cause your body to take strong gasps for air. This is known as a “torso reflex”. It will cause you to not only gasp for air but to also hyperventilate and could cause you to swallow water. It is extremely important that you remain calm and focus on breathing and thinking clearly so that you can make the right decisions and get out of the water quickly. If you are unable to get out of the water quickly your body temperature will go down. Hypothermia sets in when your core body temperature goes below 95 degrees Fahrenheit. Controlling your breathing and staying calm will enable you to get out of the water faster- hopefully before hypothermia sets in. Getting out of the water needs to be your primary focus at this point. The longer you are in the water, the less of a chance you’ll have of surviving. This is not only because of hypothermia but because your muscles will tighten up and not be as effective in your efforts to get out of the water. To get out, focus on getting your body horizonal. With your hands holding the solid ice in front of you, kick your legs like your swimming, until you can use your arms to pull yourself out of the water at a much less of a angle. If the ice brakes, repeat this action until you are out of the water. Note: Be sure you are grabbing ice and lunging in the direction towards land and not out farther into the lake or river. Once you are out of the water, lay on the ice to spread your body weight out over a greater surface of ice. This will reduce the chances of the ice breaking and allow you to roll or slide towards land. If possible, follow the path you came in on as you know it is able to hold your weight. If you stand up, all your weight will be focused on a central location and the ice could break again. Once you are out, get warm as soon as possible. Remove your wet clothes and get in front of a heat source such as: fire place, car heater, heat pads or blanket/sleeping bag. Ensure that your head, fingers and toes get warmed up first as they are the first parts of your body to loose body heat. – Remove you wet clothes and put on new dry ones. 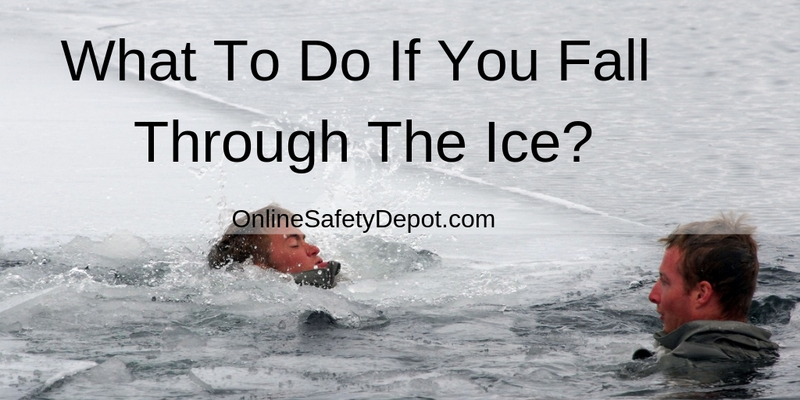 Falling through the ice is scary and should be taken seriously as your life depends on how quickly you are able to get out of the water and to a heat source. Remember, if you do fall through, focus on breathing and staying calm, get yourself horizontal by using your legs and pulling with your arms to get out. Once you are out of the water, roll or slide across the ice to safety. Once you are safely off of the ice, get to a heat source as soon as you can so that your body doesn’t go into hypothermia.